As I’ve mentioned before, my family is a bunch of peanut butter nuts. A lot of times, the in-laws in our family either chuckle or roll their eyes when yet another peanut butter dish comes into the house, and this would be a good example. The first time I made this was several years ago, before my baking experiments had exploded far beyond out of control. 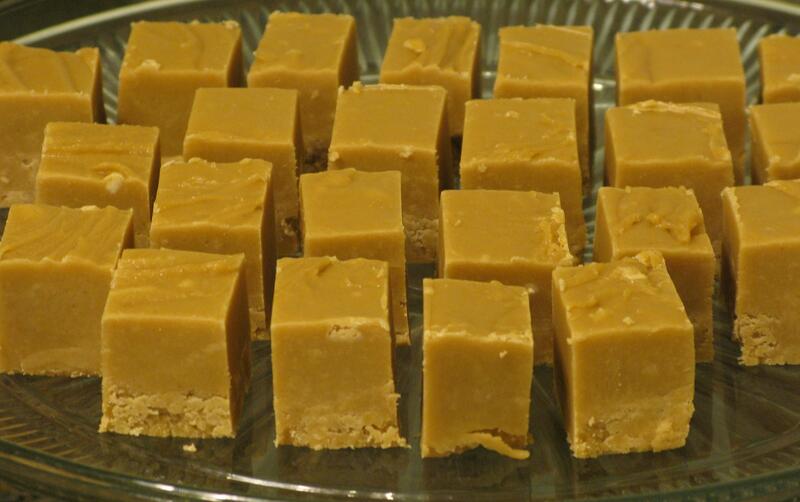 It was around the holidays, and my aunt (who usually makes the peanut butter fudge), was out of town when the family was getting together. Christmas without peanut butter fudge? No way. That can’t happen. And to top it all off, I couldn’t find that recipe that she had given me…so I had to start searching. This particular recipe is on allrecipes.com, and it is fantastic…and easy. Double whammy there. Honestly, I had forgotten all about this recipe until the holidays rolled around again and I had made the Cookies ‘n Cream Fudge. So naturally, this had to be made as well. Melt butter in a medium saucepan over medium heat. Stir in brown sugar and milk. Bring to a boil and boil for 2 minutes, stirring frequently. Remove from heat. Stir in peanut butter and vanilla. Pour over confectioners’ sugar in a large mixing bowl. Beat until smooth; pour into an 8×8 inch dish. Chill until firm and cut into squares.